It happened just before 4 a.m. Wednesday at the Circle K on Skyline Boulevard. 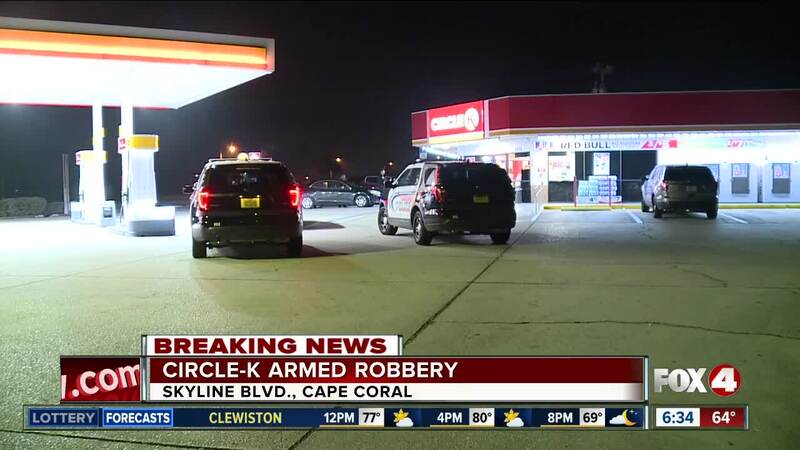 CAPE CORAL, Fla. -- Police say two men with a gun robbed a Circle K store in Cape Coral overnight and got away with cash. It happened just after 3 a.m. Wednesday at the Circle K on Skyline Boulevard. Cape Coral Police say two black men with bandanas over their faces entered the store and pointed a handgun at the manager and demanded money. One man was wearing an FGCU hoodie at the time. Multiple police officers and crime scene forensic units were on scene for a few hours. Police tell Four in Your Corner that no one was hurt. If you have any information on the identity of the suspects, please contact the Cape Coral Police Department at 239-574-3223. You can also submit an anonymous tip. Go to www.capecops.com/tips or text a tip- text CCPD+"Your Message" to CRIMES (274637). Finally, you can call Crime Stoppers at 1-800-780-TIPS. Please use this Case Report # 18-022592.